Hi loves, are you still there? I took a super long break from my blog, actually one whole year. Time went by so fast! Today I want to explain a little bit why I needed that break and what will change in the future. Blogging is my hobby while I have a full-time career meaning I work Monday through Friday, basically the whole day, therefore I can only take photos, edit them, plan and write posts etc. on Saturdays and Sundays. After years of blogging I felt kind of burned out because I didn't have the weekends to relax. I felt the pressure to also shoot after work (only possible in summer because of lighting) as "experts" suggest you need to post at least daily if you want to reach a certain following. There may be bloggers, or probably mostly instagrammers, who are successful by just shooting a few pics here and there but for most bloggers it's really time consuming work! Two year ago I moved to a new town where I didn't know anybody, I mean really no one! With that came the problem that I didn't have anyone to take photos for my posts. Seriously, you don't ask someone you just met if he or she could do a photo shoot with you (although I did a few times because there was no other way!). By now I do have friends here but it's still a lot to ask from someone to take photos of you all the time, so I'm still working on that point. Blogging is not an easy-peasy job. It actually involves a lot of planning ahead, getting up early and annoying people with your passion. The times I felt it the most was when I was on vacation - the time of the year where you should relax and recharge. There's no sleeping in because light is the best early in the morning or close to sunset, plus you want to avoid the tourist masses ruining your perfect shot. You can be lucky and stumble upon beautiful places but as a blogger you always research some nice photo spots, cafés, streets etc. Might sound fun but we were always in a rush because we had so much "work" to be done while travelling. Another thing is that I was taking so many photos for the blog already that I missed taking family photos or fun photos with friends. It got to the point where I got really pissy when things for the blog didn't work out, like the light was bad and photos didn't turn out nice, or a place I had picked as location was too crowded so photos tunrned out bad again. That was a side of me I didn't like! While I receive some products through collaborations I still felt the pressure to consume new things almost weekly to show new outfits. Sometimes even not because I wanted to actually buy a certain pair of shoes or jewellery but only because I needed something to match / pimp the outfit I wanted to shoot. That was not a sustainable way of consume! While my blog was actually growing steadily beginning of last year, my Instagram (which is a big part of blogging these days) was in a stalemate. Everytime I gained a few followers, others left, so numbers weren't growing. On the one hand numbers are important for possible collaborations but on the other hand also for motivation. I got the feeling that no one is actually interessted in what I'm doing anyway so I might as well quit. I also got frustrated with so many bought followers. Instagram seems like a bloated bubble where it's increasingly hard to tell what is real and what is fake. Now with the algorithm it's even worse! I'm sure you understand now why I've been absent for a while. Luckily I'm in a really good place now and have many new creative ideas, fresh energy and motivation, as well as some collaborations planned already. Friends, family and growing inquiries encouraged me in my decision to pick up this blog again. What's new though is that I won't put pressure on myself and will try not to compare myself to other bloggers and their success. I will probably only post every two weeks or so because of the time issue I explained above. I hope these few posts will be high-quality rather than posting a lot of rushed, not well prepared posts. I will only take photos when it's possible and not pressure myself into finding the perfect spot etc.I want to make it fun again! Thanks for your understanding. I'm very much looking forward to this new start! Eventually, a few words about my outfit: It's actually one of my signiture looks, you could say. I wear this type of combination ALL the time - pants, t-shirt, boucle blazer, crossbody bag. Boucle blazers like this gorgeous one from the current Mango collection are my favourite piece of clothing. They are chic but not formal / uncomfy like a regular, tailored blazer and you can easily dress them down with a t-shirt and jeans. 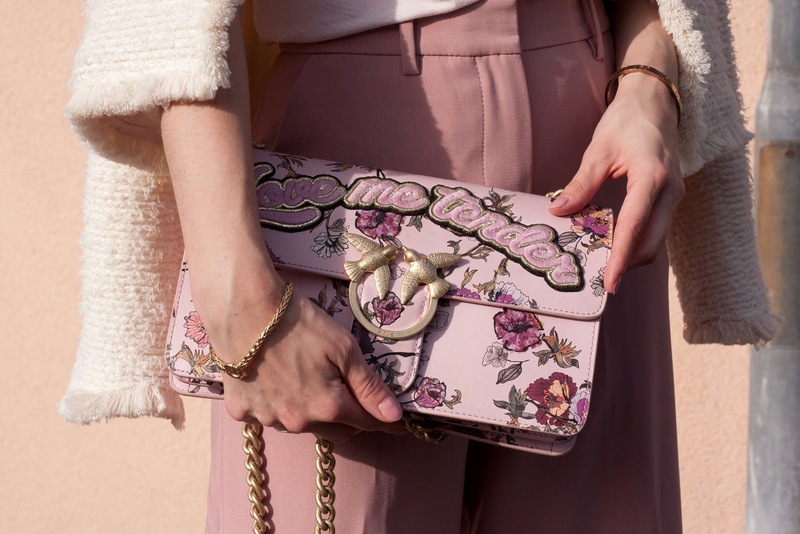 My "Love me tender" bag from Pinko is my newest addition to my small purse collection. Pinko has very bold designs that are close to being tacky but I love them as a statement! I actually got a second one in bright pink, too;) What do you think of my first look after my blogging break?